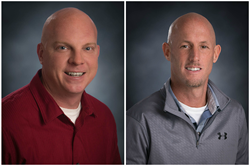 Scott Warner and Todd Mower have been promoted to Regional Directors of Construction for Wayne Homes. Wayne Homes, an Ohio-based custom homebuilder, has announced the promotions of Todd Mower and Scott Warner to Regional Directors of Construction. Mower began his career with Wayne Homes in 2005 as a field manager for the Ashland office. In 2011, he was promoted to Construction Manager and was responsible for maintaining relationships with homeowners, co-workers and trade partners, as well as, leading a team responsible for building scattered site homes throughout the Ashland building area. Warner joined Wayne Homes in 2003 in the estimating department. Since then, he has held several management positions, including Estimating Manager, Product Development Manager, Field Manager, Warranty Manager, and most recently, Sales Manager of the Portage location. Before Wayne Homes, Warner served in the United States Army and Army Reserves. Warner currently resides in Sebring, Ohio with his wife, Lori, and has three daughters, Ashley, Abbigail, and Hannah.